In a statement published earlier today, the National Union of Journalists of the Philippines (NUJP) condemned this writer, R.J. Nieto who goes by the nom de plume ThinkingPinoy, “for endangering a journalist” because of “a mistaken accusation” [NUJP]. NUJP issued this statement of condemnation without contacting me, which I find ironic because the Second National Congress of the NUJP itself adopted and endorsed the Principles and Premises on the Press in 1991. Specifically, the 1991 document enjoins media practitioners to comply with the 1966 International Convention on Civil and Political Rights, which includes the right to a fair trial [UN]. 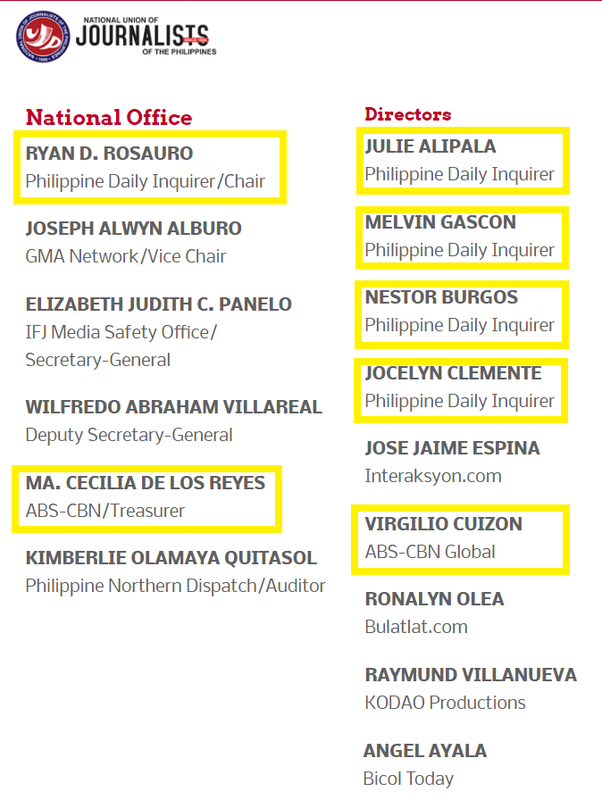 But we are talking about NUJP, where five of its nine board members are from Inquirer and ABS-CBN, so I sincerely am unsurprised. Regardless, to clarify the issue, let me give you a chronology of what transpired in the ongoing TP-Aznar saga. NUJP, despite being filled with “professional journalists”, got the accusation wrong. The material-in-question was a video clip and not just a photo. 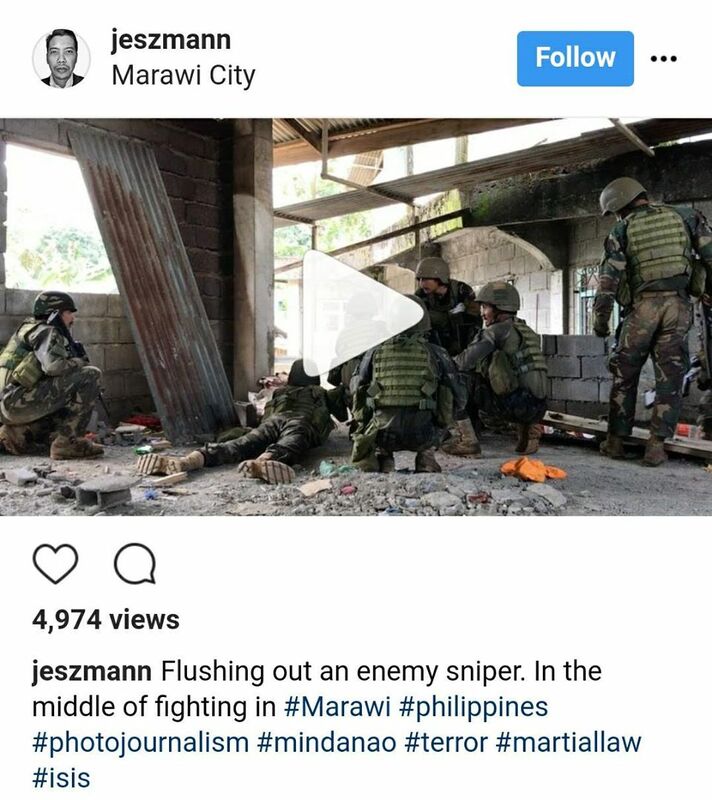 Aznar uploaded that video with the original caption: “Flushing out an enemy sniper. 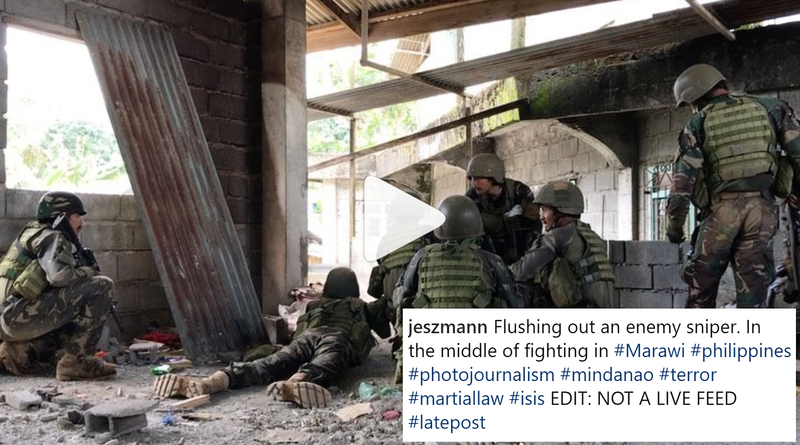 In the middle of fighting in #Marawi #Philippines…”, without stating the time it was taken. A screenshot of Aznar's original video post, before he edited the caption. Now, tell me Mr. Aznar, how would “in the middle of fighting” be construed? In one of the chat threads on his Facebook account and before issuing any formal statement, Aznar said the video was taken over three weeks ago and it was a late post. He was vague about the exact time it was taken, and the exact time it was uploaded. Aznar then attempted to tamper with the evidence by surreptitiously editing his Instagram post, adding the hashtag “#lateupload”, among others. Aznar inserted "Not a live feed #latepost" after being called out. I also called this out so Aznar, again, edited the caption to include the term “EDIT:”. Good. He thought he’d get away with it. Now, is a video taken just less than five hours before posting qualify as a “#latepost”? The main point of contention in NUJP’s statement is that Aznar’s claim that the video wasn’t a live feed. However, when a regular citizen like me says “live update”, I meant information about an event that is posted on, or immediately after, the event. Both Aznar and NUJP used the phrase “Live Feed”, a term that I never used. NUJP and Aznar can attempt to take refuge on semantic nitpicking all they want, but what’s clear is that available information clearly shows that the video was posted just a few hours after it was taken. Aznar then issued a lengthier, seemingly more formal reply. Aznar then went on to threaten me with a lawsuit, a lawsuit that I will gladly welcome with a countersuit. I find it interesting that NUJP wrote this condemnation with a passion, and I think I know the reason why. In his post, Aznar clarified that he works neither for the Philippine Daily Inquirer nor the New York Times, although he admitted that his works are regularly published in the New York Times. Note, however, that an Inquirer article with his name on the byline exists [Inq]. I guess the more appropriate term, vis-à-vis Aznar’s relationship with the Inquirer, is “worked”. With that said, it’s interesting to point out that four out of the nine NUJP board members, along with its president, are from the Philippine Daily Inquirer, Aznar’s former business associates. NUJP's president and four of its nine board members are from the Inquirer. Inquirer is affiliated with the New York Times. 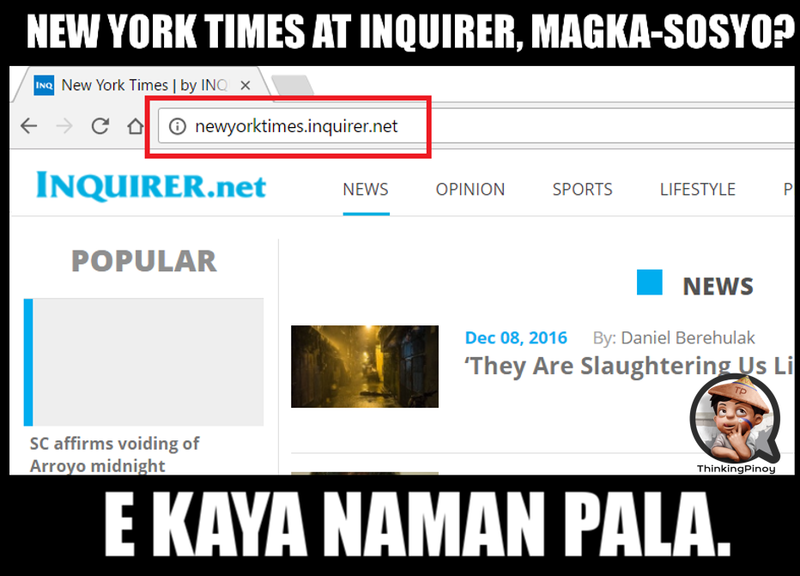 Moreover, Inquirer is affiliated with Aznar's primary business associate New York Times, as the Inquirer republishes NY Times articles through its subdomain "newyorktimes.inquirer.net". Well, "protect your own", right? Mr. Aznar, it's the same banana. 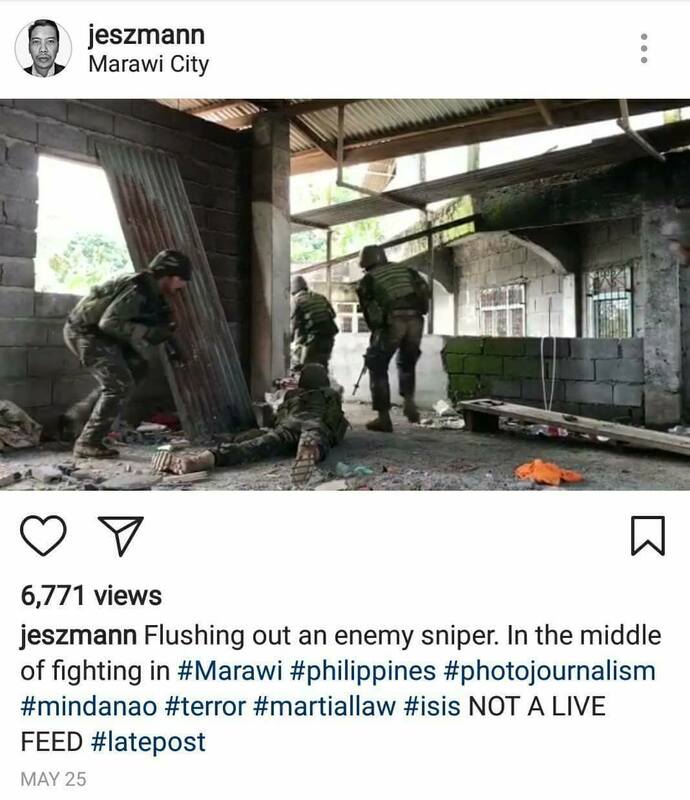 Aznar claims to be a professional photojournalist, so it’s safe to say that he went to Marawi with a mobile internet service ready. Surely, no self-respecting journalist will go to a war zone then look for a SIM card seller there. 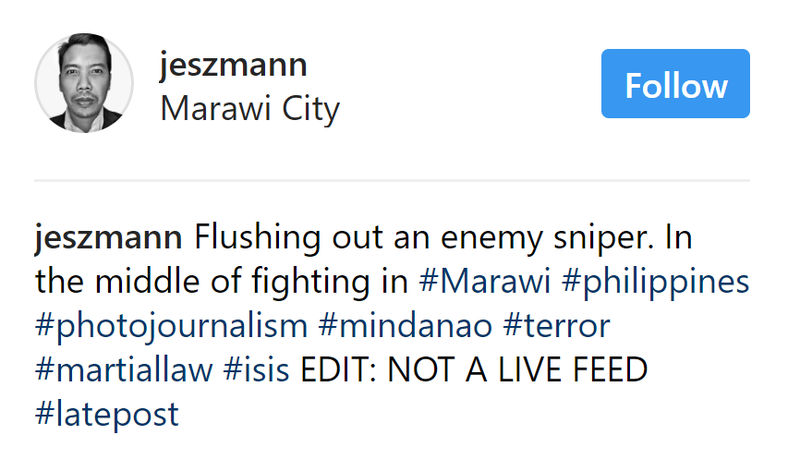 Aznar’s first ever Instagram post [IG] about Marawi was also on May 25th, suggesting that he arrived in the area on May 25th. Moreover, another Instagram photo of his shows a soldier in the same background and captioned “This was taken… as I arrive near ground zero”. Yes, he arrived in Marawi on May 25th. Aznar’s controversial video was posted at 6:13 AM UTC, which translates to 2:13 PM Manila. Judging by the amount of sunlight in the video, along with the length of the shadows outside the structure, the photo must have been taken around noon of that day, i.e. between 9:00 AM and 2:13 PM. In short, Aznar posted that video that was less than five hours old when it was uploaded. It was just the second day of fighting, and enemies are all over the place, so that Armed Forces personnel could not have gotten too far from where the video was taken. Now, let me raise a few issues connected with Aznar’s videos. First, any Maute Group member with a smartphone and mobile internet can discover Aznar’s videos and easily pinpoint the area where there’s military presence, given the former’s uncanny familiarity with Marawi’s geography. 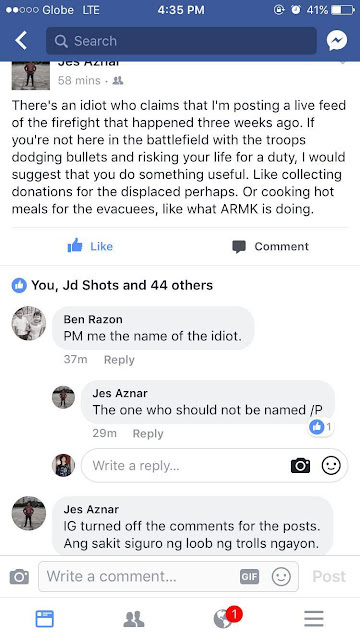 The Maute members engaged in the firefight won’t have to worry about contacting their headquarters. Why? Because Aznar already did it for them. Now, what if they sent reinforcements in response to this information? Surely, a group that managed to smuggle mind-boggling amounts of military equipment knows how to use Instagram. Marawi is part of the terrorist group ISIS, and ISIS has been known in as early as 2015 to use this platform [TheVerge]. Second, the video provides information about the military’s entry points. Now that it has been revealed to the enemy, will the AFP be able to use that entry point again? This forces the AFP to either (a) look for new alternative entry points or (2) be content with one less entry point. In short, Aznar’s video could have made the AFP’s mission tougher than it should be. Third, and I think this is self-evident given the previous point: AFP snipers cannot use that spot anymore, leaving AFP with fewer sniping spots. Again, Aznar’s video could have made the AFP’s mission tougher than it should be. Is it in the interest of the public to make the AFPs odds of winning the war slimmer by any measure? Lastly, the previous two posts assume that the AFP was able to discover the video shortly after it was uploaded. But what if it did not? That is, who among those soldiers featured in the video are still alive? Or more importantly, how many soldiers could have been injured or killed because of the information in the videos? And these are just off the top of my head. How much more for military tacticians with the requisite training and more up-to-date information on the ground?Yes, the operative word here is “could” and “may”, and NUJP and Aznar can argue all day that their posts are unlikely to have caused any of the ones mentioned above. The road to hell is paved with good intentions. The decision on what’s OK and what’s not OK is neither for NUJP nor for Aznar to make: it’s for the AFP’s. But Aznar decided to post that video clip anyway, with so many hashtags that are reminiscent of social media users who crave for attention. After his lengthy passive-aggressive I-am-the-victim-here reply, I issued a counter-statement that quickly went viral [TP]. The post has garnered over 11,000 reactions, has been shared over 4900 times, and has reached over a million Facebook users. In that statement, I advised Aznar to get out of Mindanao as soon as possible, as the AFP, empowered by the suspension of the writ of habeas corpus, may opt to arrest him for violating their May 24th instruction for civilians to "refrain from posting in social media information that would exacerbate the situation [EDGE]." After all, if I were an AFP general, I’d rather detain a reporter than risk both his life and my men by letting the reporter freely take full advantage of his idiocy. I checked all my posts about Aznar and this is the only threat I issued. I do not understand how this threat could be construed as illegal, especially since I exercised restraint on my part by not divulging information that could make him one of the most hated persons in the country. So how, exactly, did I “endanger” Aznar’s life? Is it because of the flak he got from netizens, the deluge of criticisms that forced him to turn off commenting on both his Instagram and Facebook profiles? No, I did not "endanger" Aznar's life. I simply bruised his ego. Big time. Aznar, after receiving so many negative comments, set his post to private and started deleting most, if not all of them, then put the privacy settings back to “public”. Despite that cowardice, I agree that there have been comments on his thread, posted by other netizens, that involve threats. I do not condone illegal behavior, especially if it involves the issuances of threats to life and to national security. 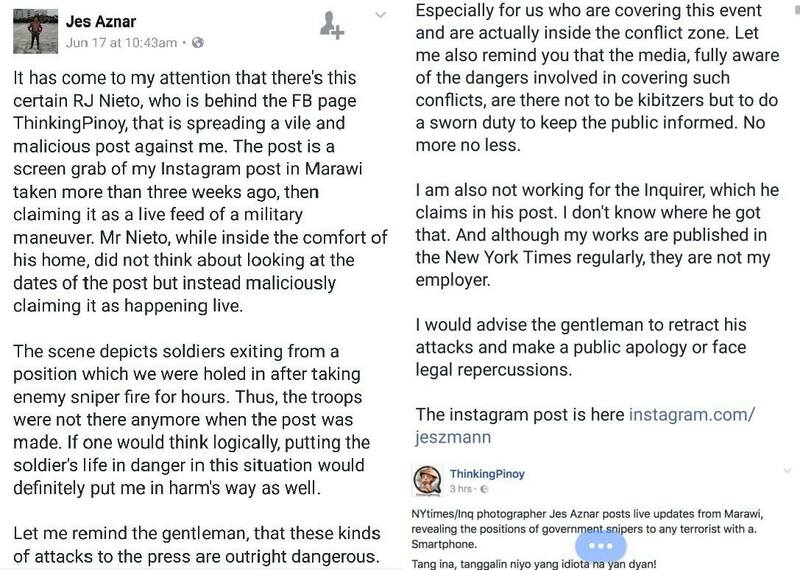 That’s the exact reason why I was livid when I reacted to Aznar’s post, as his video could have unnecessarily put the lives of our brave soldiers at greater risk. That’s also the reason why I called out Rappler when it endangered national security by leaking confidential information when I was covering Foreign Secretary Alan Peter Cayetano’s press conference in Moscow, Russia. However, how people react to to information is not within my control, and I believe it's infantile for both Aznar and NUJP (a.k.a. “Inquirer”) to blame me for the actions of other people. Truth be told, if Aznar exercised some humility in his statements and refrained from blatantly displaying arrogance and self-entitlement, the public would've responded very differently, perhaps even favorably. Now, common sense dictates a blatant show of arrogance against someone with over 500,000 followers will probably result in those 500,000 feeling a sense of revulsion against you. That is human nature, you idiot, so don't come to your NUJP overlord crying for help, because that won't change the situation. Besides, Mr. Aznar, sans the death threats, I do not personally care about you or your well-being. That's your problem. It's the well-being of our brave soldiers that I truly care about. You know, the ones whose success really counts. The safety of our soldiers is more important than your ego. Aznar takes pride in his self-proclaimed bravery, being a war correspondent in the Marawi Siege. Thus, I do not understand how Aznar, who takes pride in dodging live bullets, could be intimidated by social media comments which, as one ex-PR lady puts it, is just “manufactured noise”. I expect a seasoned war correspondent to be tougher than that: the Filipino People deserve better than just the likes of Aznar. Photojournalists do their work best when behind the camera. Stay behind it. Pabida ka kasi masyado. To make matters more comical, Aznar even cried for help from NUJP. Why comical? Because he asked for help from an organization that has already lost its credibility [TP: NUJP Officers], and has a very weak following. NUJP has fewer than 10,000 followers for crying out loud! Let’s me do just that. On 14 September, self-confessed hitman Edgar Matobato testified in the senate that he was part of Pres. Rodrigo Duterte’s alledged “Davao Death Squads” [Yahoo]. Those who watched the senate hearing questioned Matobato’s credibility after he claimed, among others, to have killed someone in a “McDonald’s Hotel”, a non-existent place. Less than 24 hours after that testimony, the New York Times published a video interview, featuring Matobato as he tells an interview basically the same things he told the senate. The problem, however, is that the statements he said here are inconsistent with the ones he said in the senate hearing. For example, Matobato told the Senate he killed four of Speaker Nograles’ bodyguards. But in the NY Times video, he said he killed five. The New York Times’ failure to vet the problematic source is a problem in itself, but what’s more alarming is the timing of the video’s publication. Now, who shot that video and sold it to NY Times? Jes Aznar. Have we heard Aznar speaking out about the inconsistencies in Matobato’s testimony? Despite his involvement in the international demolition of the Philippines’ reputation, the answer is No. What’s worse, Aznar sold the video to a foreign newspaper, which opened the Philippines to foreign interference even before the senate hearing, which should be proper venue. Aznar has also provided the New York Times with most of the unflattering photos it used in its coverage of the Duterte Administration. New York Times reporter for Southeast Asia Richard Paddock has written the most about the administration, and most, if not all of his articles, contain material bought from Aznar [Google]. Surely, Aznar could not have simply emailed them the photos and left the NY Times writers to their own devices. As a photojournalist, he must have given NY Times the “context” behind each and every photo he sold them. So, let me ask, what kind of “context” has Aznar been feeding Paddock? Surely, fairer “contexts” would’ve resulted in a less slanted articles from Paddock. Is Aznar actively espousing the destabilization of this government in the name of ambition? Mr. Aznar, I have more information here. Do you seriously want to go that route? I have bigger fish to fry, Mr. Aznar, so stop crying. And NUJP, please. No one listens to you anymore. If you simply resort to trial by publicity, I am pretty confident that your audience is smaller than you would like to believe. File a lawsuit, any of you. Make this worth my while. Aznar, you're probably a hero to your 13 followers. But for the vast majority of Filipinos, you are not.